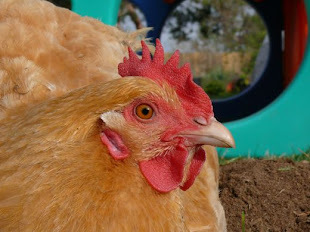 Fiona Buff Orpington is a fine hen. First-rate. Pretty plumage, sweet disposition, kind and curious. She has a smart profile, darling feet, a pert comb, and a refined plumpness, which is most becoming. She is a beauty, and your photography catches it. Buff Orpingtons are one of my favorite breeds... but I probably told you that before. Once we had two, both named Susie, because they sort of belonged to our toddler, and his big sister had the idea of giving them the same name so that the little guy wouldn't have to try to tell them apart. Two Susies! That's brilliant. All of our Cuckoo Marans are variations of Thompson... Emma Thompson, Mother Thomson, and Liberty Tomson. I agree: Buff Orpingtons are darlings!